After a humiliating defeat in the recent Jind Assembly byelection and losing the BSP as an ally, Indian National Lok Dal (INLD) supremo Om Prakash Chautala today hinted at striking an alliance with the ruling Bharatiya Janata Party (BJP). After addressing a political rally in Ladwa today, Chautala told mediapersons the INLD was open to any tie-up. Asked if the BJP could be the INLD’s alliance partner, Chautala said it was quite possible. Chautala was released on furlough from the Tihar Jail on Friday. He is undergoing a 10-year jail term in the JBT teachers’ recruitment scam case. After the Jind byelection, it was his maiden public address. While addressing INLD workers at the grain market, he avoided criticising the BJP government. To downplay the formation of the Jannayak Janta Party (JJP), the veteran politician said splits in political parties were common. Chautala admitted he did not expect a dismal performance from INLD candidate Umed Redhu in the Jind bypoll. The INLD and the BJP had first forged an alliance under the leadership of late Devi Lal in 1982. Later, both parties contested the Assembly elections in 1987 and 2000. The BJP and the INLD had also contested the Lok Sabha elections in 1999 as alliance partners. 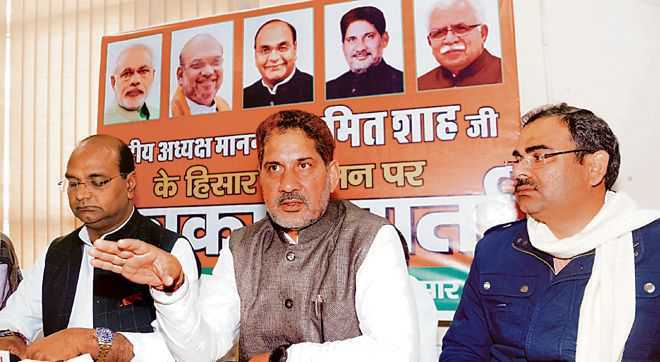 Hisar: State BJP president Subhash Barala ruled out the possibility of any alliance with the INLD or any other political party in Haryana. He was talking to mediapersons in Hisar.